Irish dancing is a world-wide phenomenon, and dancers all over the globe participate in Irish dance, music and culture. Please welcome Vicky Roberts. 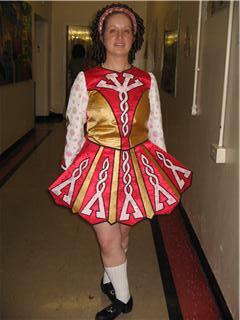 Vicky lives in Formby, Liverpool, UK, and she dances with Hopping Mad Scoil Rince na hEireann. Christy: How did you first discover Irish dancing? Vicky: When I'd gone to University in London (the first time, in 1989), I saw a poster for Inter-Railing in Ireland and it had 3three Irish dancers on it. I asked someone what they were and decided then and there I wanted to do that. 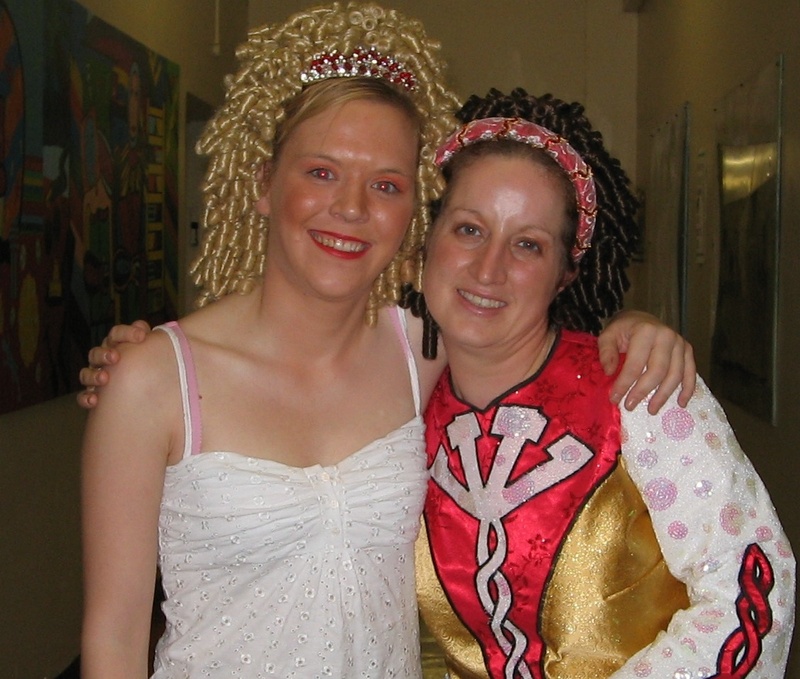 As this was pre-Riverdance, it was really hard to find an Irish dance teacher who not only would teach me but take me seriously as an Irish dancer. Simply put, back then it just wasn't done to be older and starting to learn Irish Dance! After a few hiccups, I finally found Linda Fryday (now Linda Fryday-Rafferty) who was quite happy to have an older dancer, and taught me my basic steps. When I left London, I stopped dancing for a while as I couldn't afford lessons as I was out of work, and when I eventually found work back in London, a friend took me along to her Irish dance teacher - Maria Barry & the Barry School (now Maria Geoghegan & re-named Rince Mor Academy). When I left London again, I went back to Liverpool & went to dance with Scoil Rince Ferguson. I still train with my old school, but because George Ferguson doesn't compete anymore, I have been taking "lessons" via Skype from the Hopping Mad dancers in Brighton, East Sussex. Christy: Does your school support you as an adult dancer? Vicky: Both do. George is happy to teach anyone who wants to learn, and when I first started, there were quite a few adults. As time went by, the class faded as quite a few of the adult Irish dancers got fed up "taking a back seat" to younger dancers. 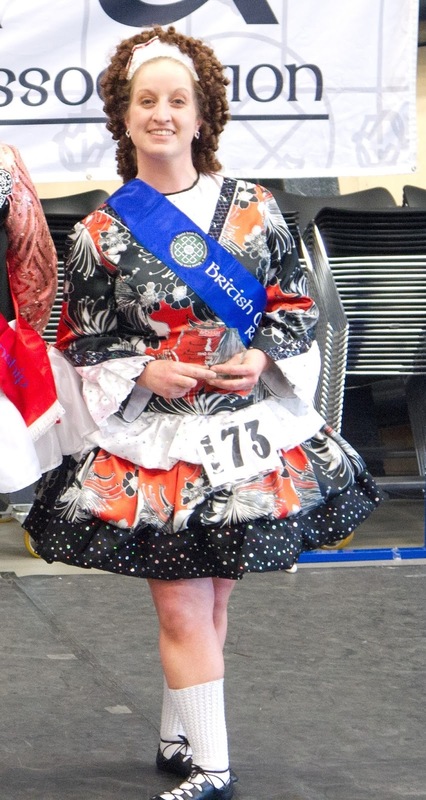 I'm pretty much the only adult Irish dancer left at the Ferguson School, and pretty much the only competing dancer, hence my decision to change to Hopping Mad. Aine started teaching adults and she is really supportive. She encourages me to do what I want to do. Christy: What is your favorite traditional set dance? Vicky: Hmmm, either St Patricks Day or Job of Journeywork, and I can't say I have a preference for either one. St Patricks is easier thats for sure. Christy: If you could change one thing about the adult Irish dance scene, what would it be? Vicky: I'd say the bias against adult Irish dancers. It's alot better than it was, and adult dancers are really starting to make an impression. Still, though, it is hard even if you find a teacher willing to teach and take you seriously when you say you want to compete. Many still expect you to take a back seat to younger dancers, which can be so annoying when you pay the same class fee's as the kids, and work sometimes twice as hard. Living here in Europe, there's a thriving open platform community of several dance associations that are very welcoming to competing adult Irish dancers. Still, having started with An Coimisiun, I'd love to be able to say I'd danced at their World Championships. I hear what North American adult dancers have to put up with, and I'm glad I dance here in Europe! Christy: Thanks Vicky! And happy dancing. Readers: Are you an adult Irish dancer, competitive or not, with a story to share? Would you like to inspire others to feel your passion for Irish dancing and culture? Do you have a question about Irish dancing? Please visit www.christydorrity.com.